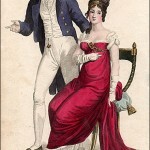 Le Beau Monde, October 1807. 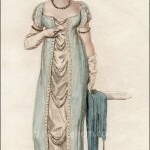 Despite the print title, these elegant evening dresses were not meant to be worn at a formal court Drawing Room, eg in honor of the King’s or Queen’s birthday. Full court dress would have been worn for those occasions. 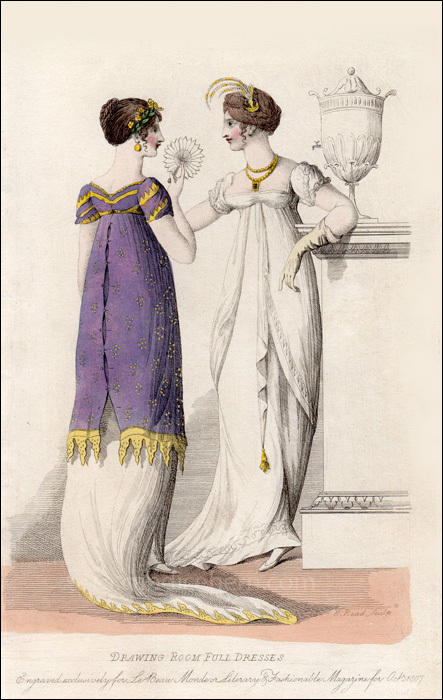 These dresses would have been worn at some other elegant, likely aristocratic drawing room party. Though the artist of this beautiful print is unknown, the engraver included his name: William Read, a popular engraver from the early 19th century through the 1840s.